Question from Audience: We keep on blaming the diet, the stress factors, the non-vegetarian food and all for the rise in diabetes and hypertension. In the lighter vein, I am asking, after all human being is an animal, do we find incidence of hypertension in animals and incidence of diabetes in animals and is there any difference between blood pressure or incidence of diabetes in domesticated and wild animals. Dr. N. P. Singh: Twenty years back, professor B. Brenner who is a renowned nephrologist and teaches nephrology, in a talk, talked about this salt handling by the kidneys and he did mention that lions do not get high blood pressure. The reason being, we throw raw meat over the lions and they are all energetic, they keep on jumping inside there. Elephants who are very obese and have sedentary lifestyle do sometimes have high blood pressure, so it is a topic which we must do a research. Dogs who are in the rural area do not get hypertension. Dogs who are in our household and are given lot of food including our own spent food, do get hypertension. Diabetes, of course, genetic predispositions. Now there are certain monkeys, I was talking to you, who have genetic predisposition and they develop diabetes. We do experiments on them to see how they progress to develop nephropathy, but I have not heard about monkeys developing type II diabetes because of their lifestyle. Question from Audience: I just want to add on this, indapamide was one diuretic, which especially has been tested in the elderly and systolic hypertension is one point which I thought Dr. Ramesh, I am sure that you would agree with, that indapamide is one diuretic. The other one is the target level of blood pressure and hypertension. Dr. Moses, you were something like Chris Gayle hitting 6s, you were going so fast, but the target level I think I would like comments, is it 120/80 or 130/80 because I feel the cutoff for a diabetic with a hypertensive who does not have a proteinuria, 130/80 is optimal one because below that the coronary events increase and the stroke events came down. I know, I have just opened up a controversy, lets get there. Dr. K K Sethi: The goal blood pressure as recommended by current guidelines of European Society of Cardiology, Indian Society of Hypertension and many others for diabetics and chronic kidney disease is 130/80 and of course it is very difficult to achieve that level and let me tell you that published data on various trials shows that no matter what combination you use, only 60% of the patients in trials where there is a very very meticulous and aggressive monitoring of the patients, 60% achieve blood pressure values of close to 140/90 and only 30% get to values of less than 130/85, but of course there is data that shows that if you below 120/80, there is a possibility of getting into the J-curve and actually losing benefit from what you actually gain by reducing the pressure. So, that is a grey area where people still say that excessive lowering of blood pressure may not be beneficial, but certainly increase in the blood pressure is definitely associated with kidney damage, atherosclerosis and other cardiovascular complications and more so in diabetes. 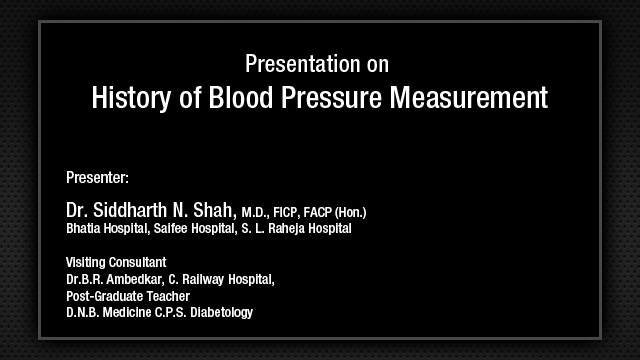 Dr. Siddharth Shah: Recommendation has been to bring down the blood pressures with comorbid conditions in hypertension to 130/80, but looking at the ACCORD trial, the recent guidelines of ADA in February 2013, has recommended to bring down the blood pressure to 140/80 as target for diabetic patients with hypertension, so this is the latest guidelines that has come and we are still debating whether it should be 130/80 or 140/80 because increased mortality was seen in a diabetic, especially in ACCORD and this has been debated a lot. Dr. S.S. Ramesh: How low is normal for diabetic patient, because if you really see HOPE and HOPE 2 trial where the patient did not have so called hypertension and if you really believe the HOPE trial results, with a very high dose of ramipril, there was a significant reduction in stroke, significant reduction in coronary artery disease, significant reduction in progression of renal failure. ACCORD really played a bad tone, that was one trial suddenly it deflated all our enthusiasm about the role of ACE inhibitors in diabetes, because you made a statement that in diabetic only if the blood pressure is high, then you will start treatment, with a normal blood pressure we should not treat, but HOPE trial and many of these trials showed that even with a normal blood pressure in a diabetic, like ADA recommends aspirin for all diabetics, they also recommend that the small dose of ACE inhibitors for all diabetics. What is your opinion? Dr. N. P. Singh: I believe that we should not look at individual separately, like hypertension, diabetes. Overall, the patient remains the same. If we are able to provide him with a good quality of life without proteinuria and he has good physical activity with a blood pressure of 130/80, I think that should be more than enough, but try and target them very strongly. Please understand that many of them will be dippers as well, so they might end up having a low blood pressure at night, which might have an adverse effect, that is why the “J” hypothesis. So, we need to individualize the treatment rather than talking about as a group. Dr. K K Sethi: The issue is slightly different and let me just intervene here. You see the issue here is that most treatments for hypertension or blood pressure in diabetics are aimed at reducing proteinuria. Now, the question that has been asked is if a patient has normal blood pressure today, should he be given ACE inhibitors, ARBs or anything else for benefits on cardiovascular health as well as for reduction of proteinuria or at least for delay in onset of proteinuria. Dr. N. P. Singh: There is no evidence as of today. If patient is non-proteinuric and normotensive given ACE inhibitors, there is no evidence. HOPE also showed prevention of diabetes with ACE inhibitors, now we are talking about diabetes being caused by ACE inhibitors so there are not, a single study cannot be an overall guideline, we need to look into the other aspect. Dr. S.S. Ramesh: Both HOPE and HOPE 2 clearly showed that even with a normal blood pressure with 10 mg of ramipril they showed a significant improvement. Should we routinely give ACE inhibitors to all diabetic patients irrespective of the blood pressure or you wait only for hypertension and then start that. Dr. Isaac Moses: Personally, I would wait for the hypertension to start and then give. Dr. Siddharth Shah: There has been very little studies now that emphatically say that we give ACE inhibitors in every patient of diabetes for control of blood pressure if the blood pressure is normal. Especially, latest guidelines have come, it would not be prudent to lower the blood pressure much more in a diabetic patient, so overtreatment would be a mistake in patients who are diabetic with hypertension. 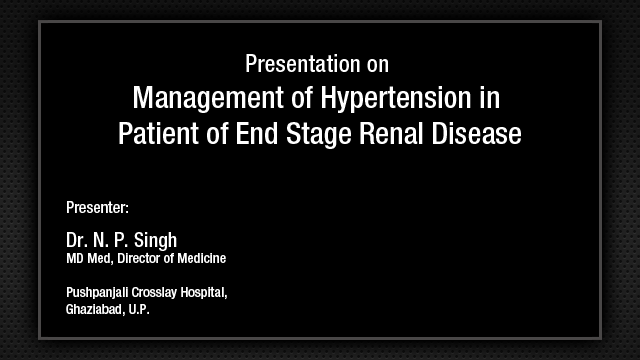 Dr. N. P. Singh: There is one question on what is the affect of the iatrogenic AV fistula on systolic hypertension in patients with CKD stage 5B and what should we target, mean blood pressure, ambulatory blood pressure, average systolic, or average diastolic. 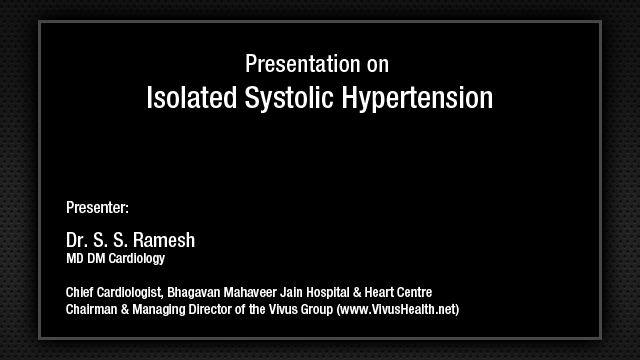 Dr. S.S. Ramesh: Continuing that, actually the HYVET trial what I alluded to, that is what you know the emphasis that many times as, especially systolic hypertension, there is more white coat hypertension. If the patient is anxious, the pressures are high, so HYVET trial is one of those which tried ambulatory blood pressure monitoring. That means patient goes on with ambulatory blood pressure. If on ambulatory blood pressure, the systolic blood pressure is high, then only, you know, you treat. Just because in office you see a high blood pressure does not really mean because they feel that you know in the office you record a pressure of 170/80 whereas when he goes out pressure could be normal and your antihypertensive treatment may further reduce the blood pressure and you may have postural hypotension and it can worsen his problem. So, the recommendation is especially you get the blood pressure checked at home with android sphygmomanometer or get a ambulatory blood pressure monitoring. If on those, in the normal circumstances, you rule out white coat hypertension and still the blood pressure is high, than only it should be treated. Dr. K K Sethi: I think I need to clarify a few things regarding the definitions of systolic, diastolic, mean blood pressure and the average mean systolic pressure that you get. See the, first thing is that we do not treat mean blood pressure in clinical practice. Mean blood pressure by definition is diastolic pressure plus one third of pulse pressure. That is mean blood pressure. We look at mean blood pressure when we are looking at hemodynamics in cardiac catheterization lab, so that doubt should be cleared from everybody's mind; however, when you are managing patients with ambulatory blood pressure, you get 3 types of reports, so there are 3 things in that ambulatory blood pressure reporting. The first thing is average mean systolic blood pressure that is what they give you which is the 24 hours average of the systolic blood pressure. Similarly, they give the average of the diastolic blood pressure, then they give you average daytime systolic pressure and average nighttime systolic pressure, so these three are different readings and the cutoff lines for these three values are different. So, 130 or 135 mmHg, is actually whatever guidelines you have for normal clinic blood pressure, reduce 10 mm for ambulatory, you know that is an easy way to remember things, so that is how it is and the nighttime pressure should be at least 15% less than the daytime pressures to call it a proper dipper and non-dippers have heightened sympathetic tone or various other reasons for non-dipping their blood pressure, but the reporting that you get should not confuse the mean blood pressure that we get on the catheterization table or we can calculate ourselves vis-a-vis the average systolic mean pressure that you get over a 24-hour period. Dr. N. P. Singh: The other benefit of doing an ambulatory is you can find out those who are non-dippers, we can split the dose of antihypertensives. These are the patients who should get an evening dose of antihypertensive as well. Question from Audience: There was a comment on the EGFR. We have two formulas, one is MDRD and other one is the Cockcroft-Gault formula. When we use this in Indian population, most of the people go for either stage III CKD, what formula you have been using? Dr. N. P. Singh: These formulas have been available for a long, long time, but they have come in more recently just to emphasize the importance of an early diagnosis of CKD. Now you are absolutely right, in CG formula, the age is one of the very important factors, so all of us who are 50+ sitting here will fall into a 60 or 70 category of EGFR, but what is also more important is whether they have an associated proteinuria or some marker of renal damage as well and also what is more important is whatever formula one uses, if you followup that patient with the same formula, you can gauge the progression of the kidney disease. If the patient is nondiabetic and non-hypertensive, just because of his being elderly has a CKD stage III, rest assured he is going to remain in CKD stage III only for the next 5 years. There was a very good Australian study, which showed that unless of course the ages so much that he falls into stage IV, but more important than that is look at the other risk factor profile and also try and look at these EGFRs when you are managing patients with antibiotics or all those drugs. A diabetic with EGFR of less than 60 mL per minute goes for a CT contrast is more likely to have an adverse event as compared to nondiabetic, so there lies a role of EGFR. I agree with you entirely just on the basis of EGFR, the patient even if we falls under CKD stage III may not necessarily have a worse outcome. Question from Audience: These formulas give a false value in Indians. I think we should have our own standard formula for EGFR. Most of the people who are normal, we have compare with cystatin C and then estimated their GFR, they are found to be normal, but when we put this formula in our Indian subsets most of them falls to stage III CKD. Dr. N. P. Singh: Not most of them, a young person with a creatinine of 1 will not fall into that. What I am trying to emphasize is there has not been a single Indian study that has tried to validate it. I agree with you in that point, but what I am trying to tell you is still in our office practice, rather than looking at the creatinine of 1.5, which may not give you much indicator about the severity, it is better to do EGFR and follow that up with the patient. Dr. K K Sethi: There are 2 formulas available for calculation for EGFR. Dr. N. P. Singh: The common ones are, the CG formula, MDRD formula, and . Dr. K K Sethi: Modification of diet in renal disease, which has been the standard formula which has been used in most research protocols and most publications and the second one is the Cockcroft formula which is relatively easy one to use and in our department we regularly use the Cockcroft Graft formula for calculation of EGFR because that is very easy to use, very easy equation, you can just multiply the age with creatinine and other factors and you get the readings. The MDRD is a little more difficult to calculate, but I think it gives fairly valid readings, and I do not have any reason to believe that it will convert a normal renal function individual in to a CKD patient. I think the nephrologist can perhaps answer that better, but in the absence of any validation as has been said by Dr. Singh, perhaps it will be prudent to continue to use that formula for making decisions in clinical practice. The patient with a creatinine of 1.2 or 1.1 often times you will find that they have actually low GFR, primarily because of the fact that creatinine itself is a poor indicator of the renal status, not because the patient actually has normal kidney function and is not a kidney disease patient. The creatinine is dependent on so many things, the body mass index, the age of the patient, how much muscle mass is there. Dr. S.S. Ramesh: Rationale in combining first generation calcium channel blockers like verapamil with newer generation calcium blocker if other combinations fail. No, there is no justification. Actually, it is very well shown when we use the same class of drugs, the complication or the side effects increase, especially if you use verapamil with dihydropyridine there is a very high chance of gum related problem and pedal edema. I think in renal transplant they have tried this combination, verapamil and dihydropyridine. Dr. N. P. Singh: The rationale is not for combination, but we give diltiazem to reduce the requirement for the dose of transplant drugs. In Indian patients the one important factor is the cost and cyclosporine is one drug which is pretty costly. If we go with diltiazem, you can reduce the requirement for cyclosporine because the levels increase with diltiazem. Dr. K K Sethi: That is because of the cytochrome P450 mechanisms. Let me just again interject Ramesh a little bit here. There is some rationale in combining, you know, the dihydropyridine with non- dihydropyridine groups and it has been mentioned in the literature there have been trials in patients with these. The only thing is that one has to be very careful in combining these drugs, but particularly in resistant hypertension where you cannot control the blood pressure with 4 drugs, sometimes you combine diltiazem with a dihydropyridine you start seeing a response because although both are L-type calcium channel blockers there is a slight difference in the mechanism by which they work, so there is some rationality in combining them in a difficult situation, not as a routine, but one has to be careful when you use them together. Dr. Siddharth Shah: Now we will conclude. Most of the questions have been answered.